but I ran out of thread. I shall be re-making that one. 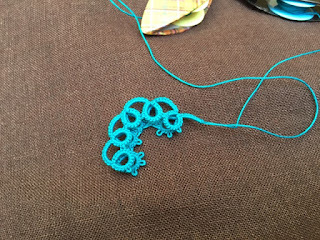 So then I thought I'd try with much smaller rings but longer picots. Yes, that's better. A lot more of the cabochon is exposed. Of course, you'll always have some of the gem hidden with a bezel type of design. But not only does this give more space in the middle but the long picots also allow more viewing of the design than the rings did. This does require the use of a picot gauge. 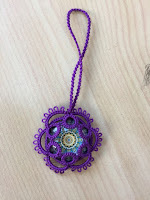 Tatting around stones and cabochons is a technique that can be seen used by Marilee here loosely following Corina's method who was actually explaining the technique as she'd seen it on a Russian forum... and once I started searching for tatting around stones on internet, I found lots of other examples so I'm not sure exactly where it first started. Anyway, I'd just never tried it before myself until seeing Diane's enthusiasm and her growing collection of ice drops! 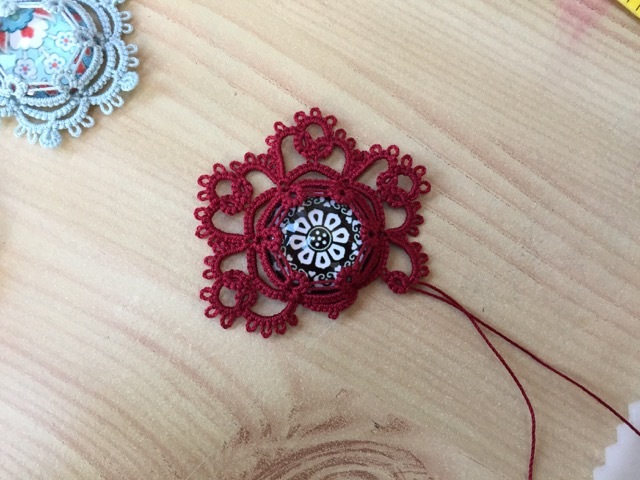 I also changed the construction... that's only because for some reason, I kept getting confused when it came to doing the top portion of the pattern, I was getting muddled up with direction of tatting so I wondered about doing both back and front and edge at the same time which worked better for me. So I make front and back rings and first chain in the first round and then just add whatever decorative extras you wish on the next round. This was another variation but again, I ran out of thread! It was a little tight anyway so rather than join new thread, I will start again on that one. so that it would be reversible (instead of just have plain white on the back). It's my favourite so far! I'd run out of thread on one shuttle (this is getting to be a theme!) so I made a spiral chain for this one instead of a lock chain (nearly all thread comes from one shuttle for a spiral as opposed to equally from both shuttles with a lock chain). This is "Fern Green Med" although it looks grey. These experiments have given me more ideas as I've enjoyed working with the glass cabochons and might now have a go with larger ones. The ones used here are 20mm. Love that pale blue one, though they all are wonderful! Wow, Love the effect of the long picots ! Besides showing off the beautiful gems, they have a daintier, elegant look. I love the back-to-back idea, too. Try it with 2 mirrors/shishas - it looks great ! I am so happy you were bit by the IceDrop Bug. Love your variations and cute gems. This concept does lead to many ideas and uses. Die sehen alle wunderschön aus. Ich liebe alle Variationen. Wow, great that you are experimenting and extending the technique. They're all beautiful! The long picots do make a difference. When I first started with Edda Guastalla's pattern, I really liked that both the front and the back were created at the same time. My problem was that the glass cabochon sometimes fell out. 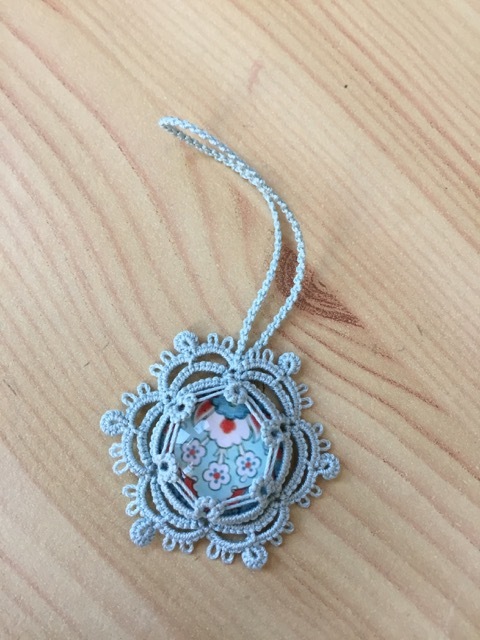 I think I may go back to Edda's tutorial and try her more advanced patterns to see if I can show off more of the cabochon designs. 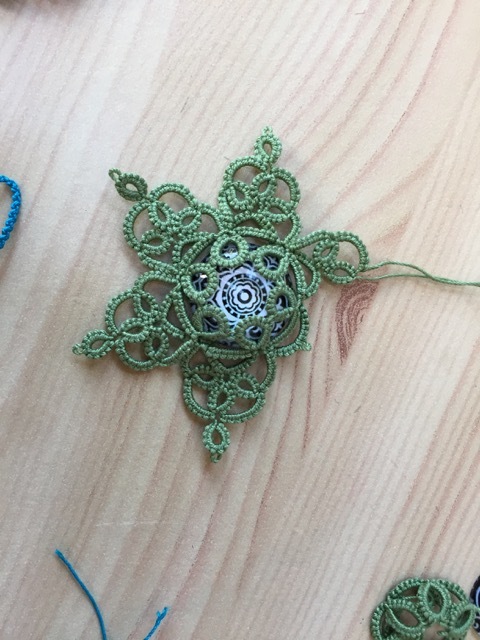 Maybe I just need to adjust my stitch count. Are your adaptations open or closed on the back? Since mine are closed, the design of the cabochon does not really show. That's not a problem with the glass gems, but I really want to show off the design of my peacock beads on both sides! Ah Edda Guastalla, that's the name I'd seen you mention before but I couldn't remember it. I'll look her up. You are right: tatting the last ring once the cabochon is inserted is a bit fiddly and it feels like you need a few more fingers to hang on to everything while you tat and close the round! 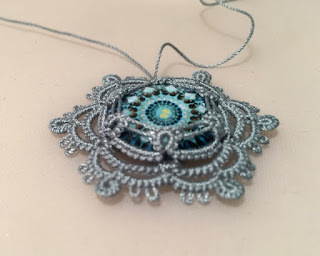 The ones here do have a larger-ring design on the back (like yours but a slightly different stitch count) but last night I tried one with back-to-back cabochons and I used the same small rings on both sides which would let you view your gems right through and I think it's going to work. I've not had time to finish it yet but I'll show that on my blog once it's done. Your peacock beads are so gorgeous, I'm going to have to find some! Oh wow, oh wow! These are stunning! Your ability to design and improve is beyond amazing! I love the light blue (of course it has Josephines) and the dark blue but then there's the red! All so beautiful! I too have gotten stuck on the direction. If I tat anything in between ice drops, then I have to relearn what I did, my notes don't help. Both sides at once...hmmm. Those long picots are perfect for displaying your lovely cabochons. I knew once you got hold of the ice drops you would come up with something and you have not disappointed us, they are all beautiful of course you have some lovely cabochons, and the need to show off the patterns and colours otherwise it would be a waste of thread. Not tried both sides at once, sounds interesting to try that. Also I must try and find some pretty cabochons so far I have only found the glass gems, the peacock beads which are gorgeous are just a little bit out of my reach, as the postage outweighs the cost of them. Tes cabochons sont superbes 😍 !J'aime beaucoup la finesse et le design créés par les longs picots. Vraiment magnifique ! 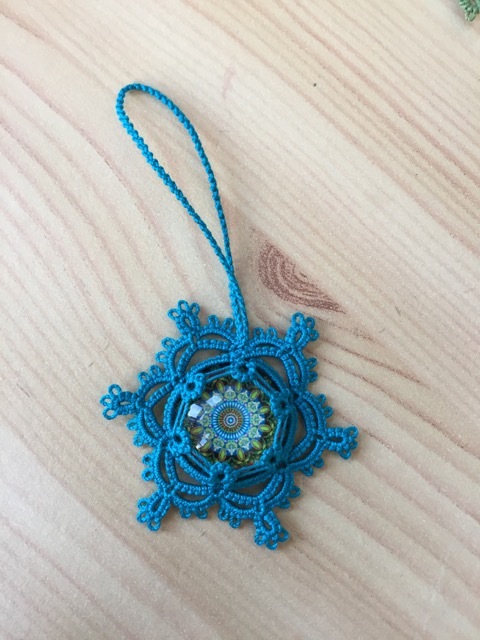 I have wire-wrapped cabochons for several years now and have decided to go back to tatting -- thread and yarn is forgivable, if you make a mistake, you just take it out and start again. 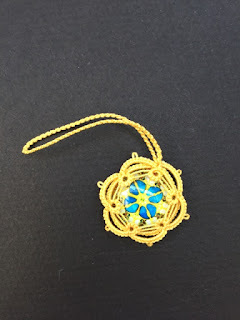 Not so with wire -- once you make a mistake, the wire is just no good any more :-( Now you've given me an idea for using all those cabochons I have acquired! Thanks!! 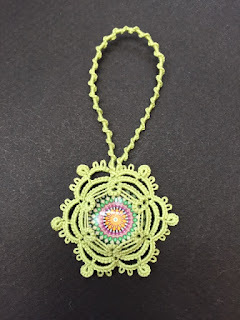 Happy Tatting!!! Wonderful! 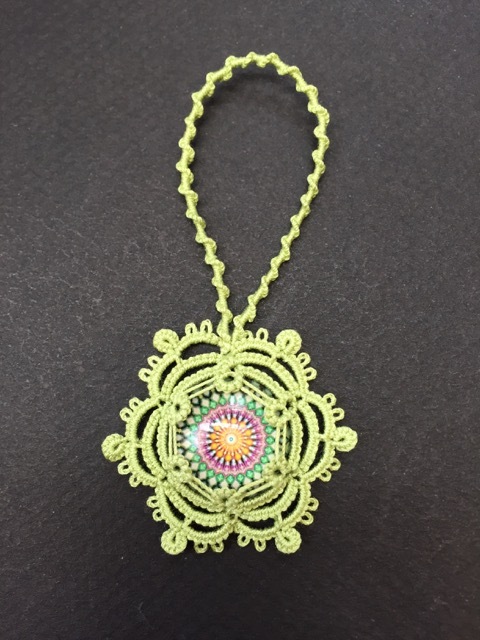 Thank you for your message Nancy, I hope it works out and that you enjoy a new use for your cabochons!